When a book, well-written and full of descriptive words, captures my imagination, I see in my mind the scene that the author suggests so intensely–with color and feeling and depth–that the image bonds itself to my experience of the book forever. In other words, from the time I read a scene that tickles my imagination like that, from that moment on, a powerful mental image immediately associates with that book. Good or bad, funny or sad. To me, these are some of the most powerful images in my whole memory- the fondly recalled, entirely imaginary, and absolutely private scenes from my favorite books. Roald Dahl, the creator of so many wonderful portraits and landscapes, triptychs and vignettes that populate the long, loping galleries of my mind, has a birthday today, September 13. He would be 97 years old today. Happy Birthday, Mr. Dahl! And many happy returns of the day to the chap who painted such happy and silly scenes in my mind. He fed me this mental eye candy that has flavored and sweetened my greater expression of life. 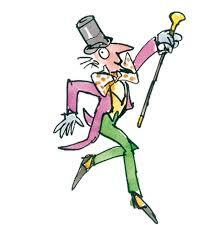 When I conjure images of Dahl’s fantastical stories, rich and colorful and elastic scenes play in my mind. I can positively see the Trunchbull swinging little Amanda Thripp overhead by her pigtails, around and around, and letting her go–the airborne child flying through the air, over the fence, and, after bouncing three times, landing, then sitting up, dazed, but perfectly fine! In my personal version of this scene, when the girl sits up after being thrown like an Olympic hammer, her eyes are crossed and those funny singing birds I remember from cartoons are flying in a little circle around her head. I can see it all–the headmaster and the schoolyard and the children and the sky and the little girl bouncing three times. It’s like a Pixar movie, all for me. Sophie, still peering out from the blanket, saw suddenly ahead of her a great craggy mountain. The mountain was dark blue and all around it the sky was gushing and glistening with light. Bits of pale gold were flying among delicate frosty-white flakes of cloud, and over to one side the rim of the morning sun was coming up red as blood. This entry was posted on Friday, September 13th, 2013 at 1:22 pm and is filed under Authors. You can follow any responses to this entry through the RSS 2.0 feed. You can leave a response, or trackback from your own site.